Learn tips and tricks for growing strawberries. Look no further than your deck or backyard to find a spot for growing strawberries. These versatile fruits grow happily in containers or beds, and are easy to grow. There are two main types of strawberries. June bearing varieties produce berries all at once, usually over a three-week period. In zones 5 and colder, fruit is usually ripe in June, but in warmer regions berries are ready sooner - as early as February in Florida. Everbearing varieties typically bear heavy crops in late spring and late summer or early fall, with lighter crops in between. When planting strawberries, choose a spot with full sun. In warm regions, try to provide morning sun with some shade protection during the hottest part of the day. Soil should have excellent drainage. 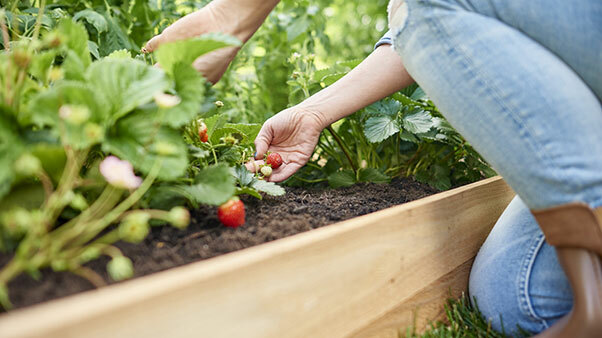 To grow strawberries in planting beds, mix 3 inches of Miracle-Gro® Performance Organics™ All Purpose In-Ground Soil into the top 6 inches of native soil. In raised beds, blend equal parts garden soil and Miracle-Gro® Performance Organics™ All Purpose Container Mix, or use 100 percent organic Miracle-Gro® Raised Bed Soil. Both In-Ground Soil and Container Mix are enriched with aged compost that provides ideal organic nutrition to get strawberries off to a strong start. If you're planting strawberries in containers, use a pot or hanging basket that's at least 10 inches across, and fill it with Container Mix. A traditional strawberry jar with pockets also works well for growing strawberries. The best time of year for planting strawberries depends on where you livespring is ideal in cold-winter regions, fall in warmer regions. The easiest way to grow strawberries is to plant strong, vigorous young plants like those from Bonnie Plants®. Cover the roots with soil, but don't plant too deeply. The central growing bud must stay above the soil so sunlight can reach it and cause it to sprout. You can grow strawberries from seeds, but plants won't bear fruit until the year after planting. First, stash the seeds in the freezer for 4 to 6 weeks to jumpstart germination. When planting, use Miracle-Gro® Seed Starting Potting Mix and barely cover seeds because they need some light to germinate, a process that will take about a month. Be sure to water well after planting. Most strawberry plants are perennial in zones 4 to 9. Many strawberry varieties send out runners, stems that produce baby plants. These small plants can root and grow, but for top berry yields, it's best to let only three runners remain per plant. Clip the rest off. Be sure to weed your berry patch faithfully, and remove any dead leaves. In fall, strawberry plants form the buds that will bloom and produce berries the following year. Cover plants with mulch over the winter in colder regions to protect the newly formed buds. Typically, gardeners use a winter mulch of straw, which is where these tasty berries get their name. 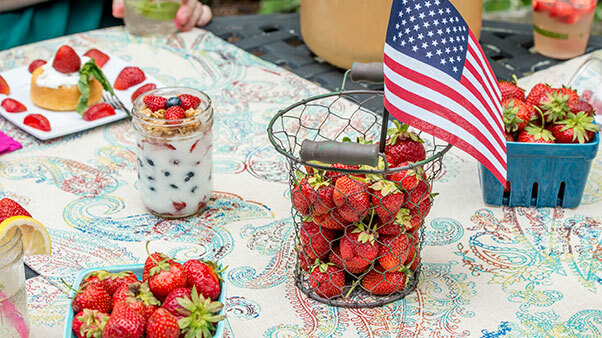 You can also use pine straw, chopped leaves, untreated grass clippings, or Scotts® bagged mulch around (but not on top of) the plants during the growing season to help keep weeds down, reduce the amount of watering needed, and keep berries clean. When growing strawberries, keep plants well-watered. Check soil weekly, and when the top inch is dry, it's time to water. Drip irrigation works well with strawberries, because it keeps leaves and fruit dry, which helps reduce disease outbreaks. Your strawberries will display their most amazing growth if you treat them to the power combo of Miracle-Gro® soil and plant food. Beginning a month after planting, apply Miracle-Gro® Performance Organics™ All Purpose Plant Nutrition Granules to restock the soil with just the kind of rich organic nutrition your strawberries need. Not only does it nourish your plants, but it also feeds the microbes in the soil that help those plants take up more nutrients. Be sure to follow label instructions to know how much and how often to apply. Birds, chipmunks, squirrels and groundhogs like fresh berries and cana. Pick strawberries in the morning, while fruits are cool. Harvest fruit that's fully colored and glossy, leaving part of the stem and the cap attached to the berry. Refrigerate berries immediately after picking without rinsing or removing the caps or stems. Ripe cilantro seed is known as coriander. To collect seeds, slip stems with seeds attached into a paper bag. As seeds ripen, the husks around them will split, dropping seeds into the bag. In the kitchen, eat strawberries fresh, or preserve them frozen, dried, or in jam. Also consider using fresh berries in baking and beverages. Dried strawberries make a great addition to granola, oatmeal, cookies and trail mix. You may also want to plant strawberries as a ground cover. You won't get as strong a yield as when you grow plants in their own patch, but you'll still enjoy fresh berries. Ready to start growing strawberries? Click on any of the product links above or to the right for more information, to purchase the product online, or to find a retailer near you. Solo porque se ve bonito no significa que no puede comérselo. No necesita tener un jardín grande para cultivar vegetales frescos. Descubra cómo sembrar y cultivar vegetales en macetas.